Christopher Scott "Chris" Thile (/ˈθiːliː/ THEE-lee; born February 20, 1981) is an American virtuoso mandolinist, singer, songwriter, and radio personality, best known for his work in the progressive acoustic trio Nickel Creek and the acoustic folk/progressive bluegrass quintet Punch Brothers. He is a 2012 MacArthur Fellow. On October 15, 2016, he became the host of the radio variety show A Prairie Home Companion. The three members of Nickel Creek met in 1989 at Carlsbad, California's That Pizza Place, listening to weekly bluegrass shows with their parents. Their first album, Little Cowpoke, was released on December 31, 1993. Later albums included Nickel Creek and This Side, which went platinum and won a Grammy for Best Contemporary Folk Album. In 2005, Nickel Creek released Why Should the Fire Die?, which received critical acclaim and sold 250,000 units. 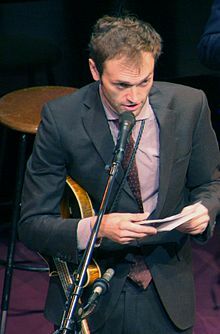 In 2003, Thile married fashion designer Jesse Meighan. The couple divorced in 2004, after 18 months of marriage. Thile has also released solo albums, including Not All Who Wander Are Lost (2001) and 2004's Deceiver, on which he wrote, composed, sang, and played every part. In 2008, Thile released a collaboration album with bassist Edgar Meyer, and he also plans to release a collaborative album with Hilary Hahn. Thile married actress Claire Coffee on December 23, 2013. Coffee and Thile have a son named Calvin Eugene Thile, born on May 15, 2015. Thile's great-great-great-great-uncle is Baseball Hall of Fame member Sam Thompson. Thile was born in Oceanside, California, in 1981. His earliest memories of music are listening to Stan Getz's recording of "The Girl from Ipanema" before he even turned one year old. When he was two, his family started going to That Pizza Place, where he listened to John Moore's band Bluegrass Etc. When Thile was four, his family moved to Idyllwild, California. Thile began playing the mandolin at the age of five, taking occasional lessons from John Moore. At age eight, Thile's family and the Watkins family formed Nickel Creek. The band performed at many California bluegrass festivals, and as a result Chris had to be home-schooled. At age twelve, he won the mandolin championship at the Walnut Valley Festival in Winfield, Kansas. That same year, 1993, Thile made a demo tape and sent it to the Sugar Hill and Rounder record labels. Both labels showed interest, but the Thiles went with Sugar Hill. The next year, Chris Thile released his first solo album, Leading Off, featuring mostly original compositions. In 1995, the Thile family moved to Murray, Kentucky, where Chris' father Scott Thile accepted a position at Murray State University as a musical instrument technician. In 1997, Chris released Stealing Second and Nickel Creek released Here to There. Chris went on to attend Murray State University for a few semesters, where he was a music major. Following the major success and platinum accreditation of the album Nickel Creek, Thile released Not All Who Wander Are Lost in 2001. The album featured guest appearances from several well-known instrumentalists such as Stuart Duncan, Béla Fleck, Edgar Meyer, Jerry Douglas, and Bryan Sutton. In 2003, Thile teamed up with mandolinist Mike Marshall for the duet album Into the Cauldron, which included original pieces as well as pieces by Charlie Parker and J. S. Bach. Also in 2003, Thile joined Mark O'Connor for his double CD set "Thirty-Year Retrospective" which was nominated for a Grammy. In 2004, Thile released Deceiver, an experimental album on which he recorded every track himself. This included electric guitar, piano, drums, violin, viola, cello, and bass. Deceiver demonstrated some pop/rock songwriting in addition to "newgrass". In August 2006, Nickel Creek announced that at the end of the year, they would no longer be recording together as a group, and their tour scheduled through 2007 would be their last for an indefinite period of time. In February 2014, the group announced that it would be releasing another album. Thile was a judge for the fifth annual Independent Music Awards to support independent artists' careers. We got together one night just to drop a ton of money, drink too much wine, eat steaks, and commiserate about our failed relationships. We had gotten to play together a few days before and we had said that we needed to do something musical together. With our hearts smashed to pieces, it became more urgent – our lives had gone the same way for so long. I knew I wanted to have a band with Gabe [Witcher], but I didn't know if it would be a rock ensemble, an ambitious acoustic classical thing or a bluegrass group. We played, and there was a serious, instantaneous connection. Then I knew I wanted to put together a bluegrass band – one with a lot of range, but aesthetically a bluegrass band. The band consisted of Chris Thile (mandolin), Gabe Witcher (fiddle/violin), Chris Eldridge (guitar), Greg Garrison (bass), and Noam Pikelny (banjo). Bryan Sutton has also filled in on guitar when necessary while Eldridge played out commitments to The Infamous Stringdusters. 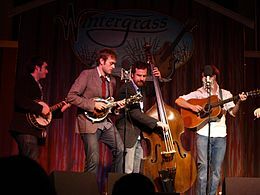 In 2007, the band officially changed its name first to "The Tensions Mountain Boys" and then "Punch Brothers". On March 17, 2007, at Carnegie Hall, this group debuted Thile's ambitious "The Blind Leaving the Blind", a 40-minute suite in four movements that Thile told NPR was written in part to deal with his 2004 divorce. Punch Brothers released its first album, "Punch", February 26, 2008, on Nonesuch Records. The album featured Thile's suite "The Blind Leaving the Blind", as well as other original songs. 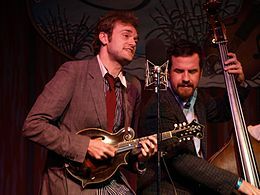 To promote "Punch", Thile and Punch Brothers planned a year-long tour in 2008, as well as a February 29 appearance on The Tonight Show with Jay Leno. In late 2008, Paul Kowert replaced Garrison on bass. Punch Brothers released Antifogmatic on February 15, 2010, and continued to tour. On November 5, 2010, the band performed "Rye Whiskey" on the Late Show with David Letterman with Steve Martin guesting on banjo. The Punch Brothers released their third album, Who's Feeling Young Now?, in early 2012. In November 2014, Punch Brothers released a single entitled "I Blew It Off", from their then-untitled fourth album. In December 2014, the band announced the scheduled release of an upcoming album and simultaneous release of another new single, "Julep". Punch Brothers latest album, The Phosphorescent Blues, was released on January 27, 2015. In August 2008, Thile and bassist Edgar Meyer announced the release date of the duo's planned debut album. The album was released on Thile's label Nonesuch Records on September 23, 2008. Commenting on the collaboration, Thile said "Edgar is one of the biggest influences on my musical life, and now I'm in a duo with him and writing songs with him. This was my dream. I always wondered what it would be like to be playing music this hard." The duo toured in September and October 2008 to promote the album. In 2012, Thile won a MacArthur Fellowship. In 2014, Thile recorded a new collaborative album with Edgar Meyer entitled Bass & Mandolin and embarked on a tour with Meyer to support the album. Also in 2014, Thile reunited with Nickel Creek to release a new album called A Dotted Line in celebration of their 25th anniversary. The group also embarked on a national tour titled NC25. Thile is featured in the documentary Bluegrass Journey, along with the rest of Nickel Creek. He has also appeared on a number of other artists' recordings, including Béla Fleck's Perpetual Motion, playing arrangements of Baroque, Impressionist, Classical and other styles of music with Fleck and Edgar Meyer; Jam Session, with Mark O'Connor, Frank Vignola, Bryan Sutton, and Jon Burr; the Dixie Chicks' Home, Kate Rusby's Awkward Annie, Julie Fowlis's Cuilidh, Dolly Parton's Little Sparrow, Dierks Bentley's Up on the Ridge, and Sarah Jarosz's Song Up in Her Head and Follow Me Down. Thile has performed as a duo with guitarist and vocalist Michael Daves since 2005. They released their debut album, Sleep With One Eye Open, on May 10, 2011. Recorded at Jack White's studio, the album consists of 16 classic bluegrass duets. Jack White also produced and played on the duo's 7" vinyl record Man in the Middle on Third Man Records. Thile and Daves met in 2005 at a bluegrass jam at NYC's Baggot Inn. In 2009 Thile completed a mandolin concerto entitled Ad astra per alas porci. The work was commissioned by a consortium of orchestras including the Colorado Symphony Orchestra, Los Angeles Chamber Orchestra, Oregon Symphony, Alabama Symphony Orchestra, Winston-Salem Symphony, Delaware Symphony Orchestra, Portland Symphony Orchestra, and Interlochen Center for the Arts. Thile performed the world premiere of the first movement with the Interlochen Arts Camp World Youth Symphony Orchestra under director Jung-Ho Pak, and premiered his entire concerto with the Colorado Symphony Orchestra on September 17, 2009. In 2011, he recorded The Goat Rodeo Sessions with cellist Yo-Yo Ma, bassist Edgar Meyer and fiddle player Stuart Duncan. On October 25, 2011, he appeared on the Tonight Show as a member of the Yo-Yo Ma and Friends musical act. Thile released a solo album entitled Bach: Sonatas and Partitas, Vol. 1 in June 2013. The work comprises three works written for solo violin: Sonata No. 1 in G minor, BWV 1001; Partita No. 1 in B minor, BWV 1002; and Sonata No. 2 in A minor, BWV 1003. Thile made his first appearance on Garrison Keillor's radio show A Prairie Home Companion in 1996, at age 15 and has returned numerous times—as a solo artist, with Nickel Creek, and with the Punch Brothers. On February 7 and 14 in 2015 and January 30 and February 6, 2016, he was the show's guest host. On July 21, 2015, Keillor officially announced that he was leaving the show and that Thile would succeed him as permanent host in 2016. Thile's first show as host took place on October 15, 2016 at the Fitzgerald Theater in St. Paul. On February 18, 2017 Thile announced that his version of the show had been renewed for another season. 2006 – Nominated for Grammy Award for Best Country Instrumental Performance for "The Eleventh Reel"
2012: Who's Feeling Young Now? ^ a b "Chris Thile". Archived from the original on January 5, 2008. ^ "AETN Presents: Edgar Meyer and Chris Thile". Aetn.org. Archived from the original on May 14, 2005. Retrieved February 13, 2015. ^ "2012 MacArthur Foundation 'Genius Grant' Winners". 1 October 2012. AP. Retrieved October 1, 2012. ^ Hughes, William (June 27, 2015). "Garrison Keillor's Reign of Terror over America's Airwaves Finally Set to End". The A.V. Club. ^ a b Bream, Jon (October 15, 2016). "Chris Thile seems right at home as new 'Prairie Home Companion' host". Star Tribune. Retrieved 2016-10-16. ^ "Past Winners Search | 2002". The GRAMMYs. Retrieved 2 December 2016. ^ "IndieHQ 2.0 >> Independent Sales Chart 9-20-2006". IndieHQ. November 20, 2006. Retrieved March 25, 2008. ^ "Film Review: How to Grow a Band". Film Journal. January 10, 2008. Retrieved November 15, 2014. ^ "Tensions Mountain Boys at Carnegie Hall". Carnegie Hall. March 17, 2007. Retrieved 2007-08-30. ^ a b "Nonesuch Records Signs Singer/Composer/Mandolinist Chris Thile and His New Band, Punch Brothers". All About Jazz. October 9, 2007. Archived from the original on December 25, 2007. Retrieved 2007-10-10. ^ "Mandolinist Chris Thile and Actress Claire Coffee Wed". cybergrass.com. Cybergrass. December 25, 2013. Retrieved December 25, 2013. ^ "CClaire Coffee Welcomes Son Calvin Eugene". People. May 15, 2015. ^ "Chris Thile: Covering the Bases". iBluegrass.com. May 20, 1999. Retrieved 2007-08-30. ^ "N". Archived from the original on December 14, 2014. ^ "Scott E. Thile". Campus.murraystate.edu. Retrieved February 13, 2015. ^ "Past Judges for the Independent Music Awards Include". Independentmusicawards.com. Archived from the original on July 13, 2011. Retrieved February 13, 2015. 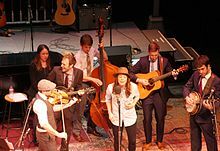 ^ "Nickel Creek's Thile 'grows' a new band". Nashville City Paper. August 23, 2006. Archived from the original on August 26, 2006. Retrieved 2007-10-13. ^ "Bluegrass Suite Packs a Progressive 'Punch'". NPR.org. February 29, 2008. Retrieved February 13, 2015. ^ "Show Calendar". Archived from the original on March 31, 2009. ^ "Chris Thile, Edgar Meyer Preview New Album at Aspen". Nonesuch Records Official Website. Retrieved February 13, 2015. ^ "Edgar Meyer and Chris Thile". Nonesuch Records Official Website. Retrieved February 13, 2015. ^ Rao, Mallika. "Chris Thile, Youngest MacArthur Genius of 2012, On His 'Dauntingly Lofty' New Status". Carolinaperformingarts.org. Retrieved September 1, 2014. ^ "Nonesuch Releases Chris Thile and Edgar Meyer's "Bass & Mandolin" on September 9". www.nonesuch.com. Retrieved September 1, 2014. ^ Klein, Bradley. "Chris Thile and Michael Daves Interview". Mandolin Cafe. Retrieved May 9, 2011. ^ "Chris Thile Premieres His Mandolin Concerto with Colorado Symphony". Nonesuch Records Official Website. Retrieved February 13, 2015. ^ "Oregonian: Chris Thile Reinvents His Instrument with Mandolin Concerto". Nonesuch Records Official Website. Retrieved February 13, 2015. ^ Tackett, Dan (September 1, 2009). "Chris Thile composes Mandolin Concerto". Archived from the original on February 19, 2012. ^ "Reviews of Chris Thile's Mandolin Concerto". Violinist.com. Retrieved February 13, 2015. ^ "The Goat Rodeo Sessions". The Official Yo-Yo Ma Site. Retrieved February 13, 2015. ^  Archived October 22, 2011, at the Wayback Machine. ^ "Special Guest Host Chris Thile – February 7 & 14, 2015". prairiehome.org. February 3, 2015. Retrieved 2015-04-03. ^ Cameron Matthews (July 21, 2015). "IT'S OFFICIAL: CHRIS THILE TO BECOME FULL TIME HOST OF 'A PRAIRIE HOME COMPANION'". thebluegrasssituation.com. Retrieved 2015-07-21. ^ "Grammys 2015: Complete list of winners and nominees". Los Angeles Times. ^ "Chris Thile's "Bach: Sonatas and Partitas, Vol. 1" Out Now; Watch Thile Feature on PBS "NewsHour"". Nonesuch Records Official Website. Retrieved February 13, 2015. ^ "Mandolinist Chris Thile Teams Up with Bluegrass Guitarist Michael Daves for Nonesuch Release "Sleep with One Eye Open" May 10". Nonesuch Records Official Website. Retrieved February 13, 2015. ^ "Amazon.com: Yo-Yo Ma, Stuart Duncan, Edgar Meyer, Chris Thile: The Goat Rodeo Sessions: Music". Amazon.com. Retrieved February 13, 2015. ^ "Nonesuch Releases Duo Album from Mandolinist/Singer Chris Thile and Pianist Brad Mehldau, January 27". Linda Seida. "Chris Thile – Biography – AllMusic". AllMusic. Retrieved February 13, 2015. "Bluegrass Bios". Archived from the original on March 21, 2009.